The massacre at the campus of Virginia Polytechnic Institute and State University (Virginia Tech) was the deadliest peacetime shooting by an individual in US history. What Seung-Hui Cho demanded was a blood sacrifice from the world. His choice of victims was almost random. The exception was the first one, the girl he shot as she slept; her boyfriend was a straight arrow whom Cho happened to see at the firing range where he practiced. If he made Cho feel inferior, it was entirely in Cho’s imagination. Everything was in his imagination; it always had been. Since childhood he had remained uncommunicative, even with his family, and his self-isolation grew more extreme when he got to Virginia Tech. His English professor noticed the anger expressed in writing projects, and pleaded with college authorities to get Cho to seek help. But that would have infringed his civil rights – like the privacy laws which prevented Virginia Tech ever knowing that Cho’s mental health had been the subject of much previous anxiety. Cho paused after the first two shootings. He returned to his room and wrote a manifesto of his loathing for the world. In it he praised the Columbine High School killers as ‘martyrs’. Then he mailed it to NBC News. Meanwhile the police chased the wrong man, not bothering to tell the college of the nightmare – currently arming himself with guns he’d collected in previous weeks – stalking the campus. Cho waited two hours for classes to begin, chained the doors of one of the halls shut behind him, and worked his way through four full classrooms, blazing away. In less than 15 minutes, he reduced them to blood and gore, only stopping when the police blasted open the hall doors. Then he reversed one of his pistols and shot himself. An enquiry later noted that if Cho’s human rights hadn’t prevented Virginia Tech from ‘connecting the dots’, 33 lives might have been saved. Death toll: 33 dead (27 students, five faculty members, and Cho) and 23 wounded. 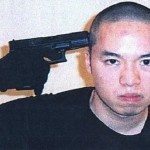 You should know: Cho’s imaginary life included calling himself ‘Question Mark’; a ‘supermodel’ girlfriend called ‘Jelly’ who ‘travelled by spaceship’; and reporting to his room mate that he was ‘vacationing with Russian Prime Minister Vladimir Putin’ having ‘grown up with him in Moscow’. But a Senior in Cho’s class who read his one-act play told a friend: ‘This is the kind of guy who is going to walk into a classroom and start shooting people’.